See what life was like on a fort in northern England. Explore the Roman baths in Bath, England. Learn about gladiator games held in Roman London, and see a reenactment in 2017. Find out more about Roman roads, including how to build one. Zoom in on objects from the Mildenhall treasure, including the Great Dish. A day in the life of a 10-year-old boy in Roman Britain. Find out more about growing up 2,000 years ago. Lots more about life and food, including recipes, in Roman Britain. Discover a hoard of Roman rings found in eastern England. Read more about life and people in Roman Britain. Watch a video clip about Hadrian's Wall and how the Romans defended the northern frontier. See the remains of Housesteads fort on Hadrian's Wall. An interactive guide to Housesteads Roman fort. Take a closer look at what a Roman soldier wore. Seven ingenious things the Romans brought to Britain. An interactive map of Roman remains in Britain. Lots more about the Romans in Britain. A comprehensive history of the Romans in Britain, from Julius Caesar’s first invasions and Boudicca’s rebellion to the founding of Roman London and the building of Hadrian’s Wall. Full of detailed illustrations, dramatic artwork, reconstructions, photographs of Roman mosaics, statues and other artefacts. 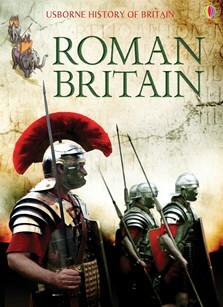 Features a large picture map of Roman Britain, showing all the most important Roman sites, towns, roads and army forts. Includes links to websites to find out more information via the Usborne Quicklinks Website.